I know, I know… lots of you hear a phrase like “mandatory binding arbitration” and your eyes gloss over and your mind drifts off like it did when your high school history teacher tried to teach you about the Monroe Doctrine or the Teapot Dome scandal. And that’s exactly how companies like Comcast — and AT&T, Time Warner Cable, American Express, Sony, Microsoft, eBay, and many, many others want you to react. But here’s a decent example of why you should give a hoot about having your rights taken away by a few words in a contract you can’t possibly alter. A handful of consumers are currently suing Comcast and other cable/satellite providers for allegedly colluding with professional sports leagues to limit the availability of most baseball, hockey, and football games to high-priced add-on packages like NHL Center Ice or MLB Extra Innings. The plaintiff’s claims are valid enough that one federal judge has already shot down the defendants’ motion for dismissal, and it’s a classic class-action suit in that it involves a large segment of the public that was adversely affected, and who can be easily identified. But it may never get to trial thanks to a few words in Comcast’s terms of service and two recent Supreme Court rulings that effectively granted companies the right to skirt laws by forcing customers out of court and into arbitration. The terms also prevent you from joining your complaint with others in any sort of class action. All disputes must be handled on an individual basis and not in a courtroom. Comcast and other companies will go on and on about how this is really in everyone’s best interest, if “everyone” means the huge corporation with a fleet of lawyers at its disposal. In 2010, the Supreme Court confirmed that it’s just fine for companies to insert these clauses into user agreements, ruling that AT&T had the right to break up a class-action suit because the customers had agreed to arbitration (even though virtually none of them knew it). Since then, a growing number of businesses have added such arbitration clauses to their terms of service and contracts, giving consumers even fewer options to turn to when it comes time to vote with their wallets. And if there was any doubt where the Supreme Court came down on arbitration, that was cleared up earlier this summer when a split court sided with American Express in its fight against a class-action lawsuit. In that case, the plaintiffs were retail vendors who alleged that AmEx was forcing them into a situation where they were paying ridiculously high fees to the card company. The vendors in that case had all agreed to AmEx’s terms of service, which included an arbitration clause, but they attempted to argue that this was an instance of an “effective vindication” exception because there was no way any single one of the plaintiffs could afford to put on an effective antitrust case on its own, especially when arbitration puts severe caps on damages. However, the Supremes (well, five of them) said that effective vindication only comes into play when a plaintiff’s actual rights to statutory remedies have been impeded. So since the vendors, in theory, could arbitrate each of their claims, then they had no ability to join their claims together in a class action. But in reality, these plaintiffs could not feasibly each afford to arbitrate an antitrust case, not when the cost of doing so would be several times the maximum damages. And so the Supreme Court effectively said companies can violate the law so long as it’s financially impossible for the affected parties to prove there was wrongdoing. Which brings us back to the Comcast case. In a recent filing with the court, Comcast makes the case for compelling the plaintiffs into arbitration because each of them agreed to the provider’s terms of service. The company even admits that it might not have an argument if it weren’t for the recent AmEx decision. Even if this court doesn’t agree with Comcast, it seems inevitable that a higher court will agree that the Supreme Court ruling applies and that this lawsuit can’t proceed — not because it lacks merit, not because the class is too vague, but because Comcast customers were given no choice but to agree to these terms of service. 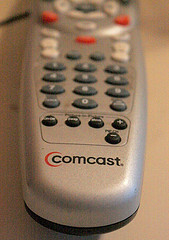 Unlike the AT&T or American Express cases where one could argue that the plaintiffs should simply have not agreed to the terms and chosen not to do business with those companies, most Comcast customers have no choice when it comes to cable providers, as cable availability is often a local monopoly. Even in areas where there are other options, the competition likely uses similar arbitration language in its terms of service. So the only choice is agree to the complicated and lengthy terms or not get cable and/or Internet service. We have no idea whether or not Comcast is in violation of the law in this instance, but that’s not the point. The bigger problem is that consumers will likely never get the chance to even make their case. If Comcast can make broad sweeping changes to the contracts, pricing, availability, for large groups of customers without having to discuss and arbitrate each point, shouldn’t affected subscribers have the ability to file a dispute as a group?